A late night post from me today (I've just got back from being all egg and spooned out at the Benewealth Games!) to show you a few new things I've acquired lately. As much as I love big make up/fashion hauls, I also think it's nice to show those random bits and bobs you pick up along the way and I managed to pick up three random purchases on my way to the till at Oxford Circus Topshop last week. That place is lethal... Seeing as my Cath Kidston phone case had got rather worse for wear, I knew this super summery watermelon wonder had to come home with me. It's really good quality, was only £8, reminds me of Dirty Dancing and may even encourage healthy eating. Winning! Another summer inspired purchase was the Models Own polish from their 'for tans' collection in the shade 'bikini'. I'd wanted a proper party neon for ages and this certainly doesn't disappoint as it's easily the brightest beauty product I own, has a great formula and looks simply fabulous against tanned talons and tootsies. The new addition I was most chuffed to get hold of has to be the colourful hair/arm candy, popbands. I've been despairing over the havoc bobbles wreak in my already unruly hair and these have completely solved my issues because they don't leave kinks- I can tie my hair right up and still wear it down afterwards without attacking it with ghd's first! They also look super cute both in the hair and on the wrists. God bless Topshop for stocking so many random things. You have picked up some lovely things! Loving the popbands too! <3 must pick them up if am out and about :) how much were they? You can't beat Topshop for random stock. 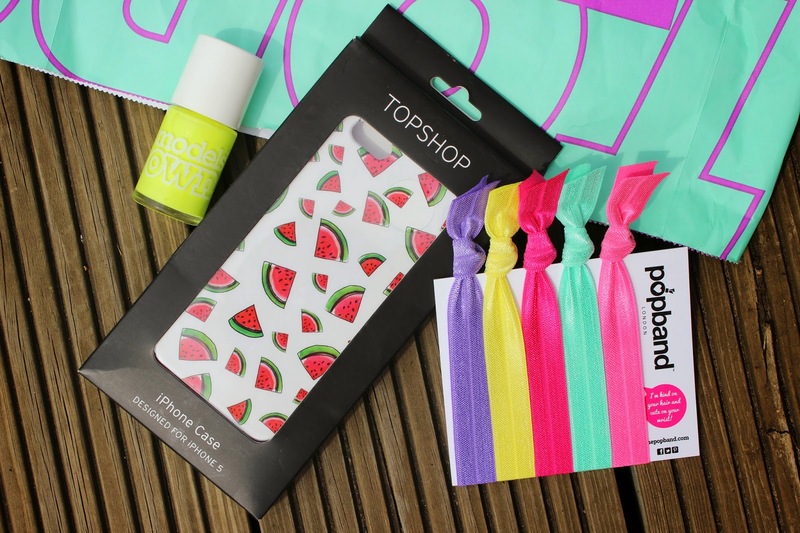 I really want to try the pop bands but didn't know Topshop sold them, so I think a lunchtime visit is in order tomorrow! The phone case is adorable! I brought the pineapple version of that phone case, and i love it! that nail polish shade is beautiful - i want it!